What links Liguria to Sicily? Obviously Genoa – Palermo ships operated by Grandi Navi Veloci and SNAV. With an enjoyable trip, you can reach Sicily travelling on-board ferries equipped with many comforts and services thought for you. You can also embark your car or motorcycle to enjoy the island in total autonomy. And if you travel with pets, we offer numerous services to carry your four-legged friends with you: they are also welcomed on-board! 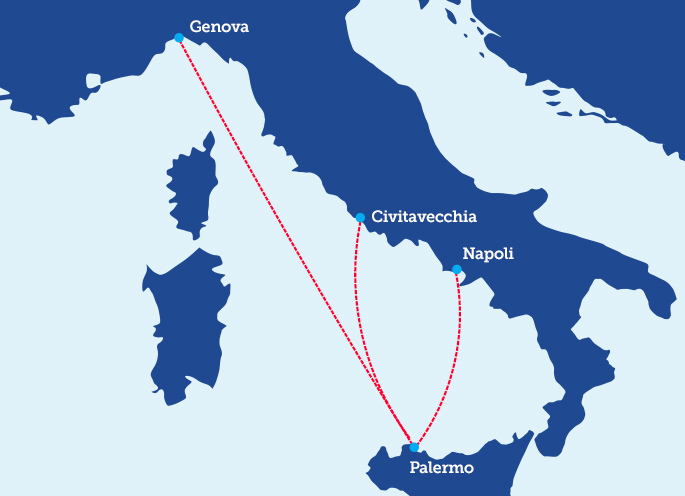 Book your ticket now on one of our Genoa-Palermo cruise ferries. Discover the convenience of our online booking system. You can purchase your ticket in a few simple steps and enjoy the holidays you have always dreamt of. Discover another way to travel. We are waiting for you on-board our Genoa-Palermo ferries.